Once thought of as an “old person’s disease,” arthritis affects more than 50 million American adults and nearly 300,000 children each year, according to the Centers for Disease Control and Prevention. It is the country’s leading cause of disability as it does not discriminate based on age, gender, or race. Women and older people have a higher risk as do those who experience obesity, joint infections, joint injuries, and those working in repetitive motion occupations. But what exactly is arthritis and how is it treated? There are various forms of pain relievers for this disease, including an array of essential oil for arthritis treatments. Used to describe inflamed joints, arthritis appears as different health conditions. This can include gout, lupus, fibromyalgia, and the two most common types, rheumatoid arthritis and osteoarthritis. Mild to severe symptoms vary from type to type of arthritis but commonly are stiffness, pain, swelling, and lack of range of motion of joints. The disease can be present on and off throughout your life or gradually become worse as you age. For many sufferers of arthritis, it can interfere with their daily activities. The symptoms can lead to other serious health conditions such as severe depression. Let’s look at several natural treatments for arthritis. Western medicine can be a temporary fix to some arthritis symptoms, with many having negative side effects. Anti-inflammatory natural oils may lessen the pain and swelling without as many medical concerns.For example, aspirin has an active component originating from the willow tree bark. There are many therapeutic herbs available in essential oil form that are used to treat arthritis symptoms. You should discuss the use of any oil with your doctor prior to treatment as many oils have properties that can interact with certain prescribed medication. 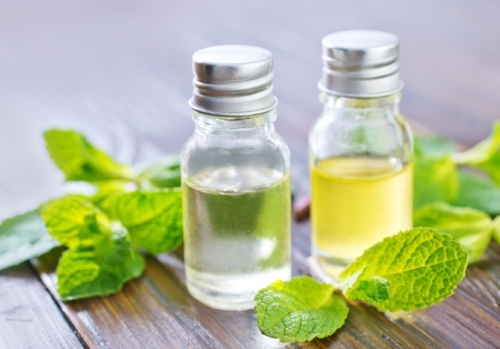 With anti-inflammatory and anesthetic components, peppermint oil can help reduce pain and swelling of joints. It has been successful mainly at treating rheumatoid arthritis. 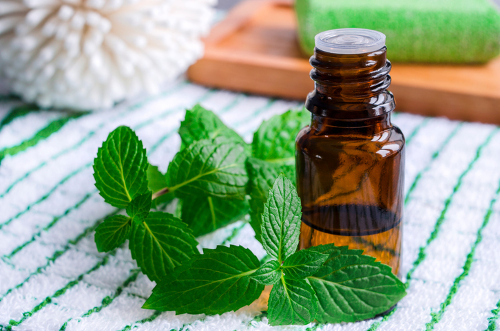 Combine five to 10 drops of the peppermint oil with two tablespoons of warmed-up coconut oil, and apply the mixture to the affected area as needed for pain relief. Australian gum tree leaves pack a punch of pain relief as the properties of the oil boost blood circulation. By opening the blood vessels naturally, it can reduce pain and inflammation discomfort. Combine eucalyptus oil with a carrier oil, and apply directly onto the painful region. You may want to test it on your skin first as its powerful properties may cause irritation for some people. Originating from the same spice you cook with, ginger oil is an ancient anti-inflammatory treatment, especially for arthritis. Its anti-inflammatory properties (NSAIDs) have been shown to suppress affected molecules and dull some inflammatory genes. Dilute the oil and massage into the affected area. You can also use it on a warm compress. A popular treatment for rheumatoid arthritis, lavender oil can increase the blood circulation to the inflamed joints and increase oxygenation, resulting in soreness relief. As it is a mild oil, three to five drops can be applied directly to the skin and massaged in a circular motion. An exceptional pain reliever, cayenne pepper oil must be applied constantly over several days to be effective. To some, it is worth it as the property capsaicin attacks and stops the transmitting process of pain to the brain. Mix coconut oil with a few drops of the cayenne pepper oil, and apply two to three times daily for several weeks. Pain may be gone for up to three months. Like many of the essential oils mentioned, rosemary oil comprises of pain relieving and anti-inflammatory properties. By rubbing the oil onto the inflamed region, the main property of rosmarinic acid prohibits immune responder cells from causing swelling and presenting fluid. Yes, we are talking about THAT frankincense oil. Taken from the Boswellia sacra tree, frankincense oil has been proved to help stop the process of rheumatoid arthritis. The research results of Cardiff University scientists show by inhibiting the production of molecules, it prevents cartilage tissue damage. Massage the oil onto the affected area. In keeping with the ancient religious tradition, myrrh is also used to treat inflamed joints. Its anti-inflammatory properties lessen the swelling by reducing the amounts of leukotaxine released because of a tissue injury. Combine myrrh and olive oil for the best results. This oil works similar to other anti-inflammatory oils; however, it uses very different properties, making it safer for people allergic to aspirin and those prescribed blood-thinning medicine. By boiling the oil, the steam targets the affected joints and enables the tissues to absorb the properties of the oil. It draws excess fluid from the tissues, reducing the pain. It also has an antidepressant element that eases the anxiety and depression that many people suffering from arthritis experience. Both an anti-inflammatory and an analgesic, birch oil can be as effective as corticosteroids. It has fast-acting results of improving joint range of motion as it reduces fluid collection. Birch oil is commonly combined with carrier oils. It should not be used by those on blood-thinning medication. Whether you use the essential oils alone or combined with other oils, there are many ways to use oils for arthritis. Knowing which two oils combined will suppress pain and joint inflammation could allow you to enjoy daily activities you have been missing out on. Many oils have harsh components and should be mixed with a carrier oil such as coconut oil, olive oil, jojoba oil, and sweet almond oil. To get an ointment paste, add melted beeswax to any essential oil combination. Remember to speak to your doctor or health practitioner before using any essential oils. Combining the properties of frankincense and myrrh has been shown in studies to relieve the effects of rheumatoid arthritis quickly and efficiently. Create this mixture for suppressing the inflammation of joints and the severity of the pain that accompanies it. The essential oils of ginger and orange combined provide a unique relief to the stiffness in joints as well as helping reduce severe pain. The pain, discomfort, and lack of range of motion stemming from arthritis can turn your day upside down. While there is no cure for most types of arthritis, there are natural ways to manage some symptoms. Using essential oils in conjunction with treatments can help manage your symptoms and help you get on with your day. Be sure to discuss the use of oils with your doctor to avoid any interactions. Bright, S., “10 Essential Oils That Can Seriously Affect Arthritis”, Natural Living Idea web site, June 28, 2016; http://www.naturallivingideas.com/essential-oils-for-arthritis/, last accessed February 2, 2017. Worthington, J., “What are the Best Essential Oils for Arthritis?”, The Fusion Model web site; https://www.thefusionmodel.com/what-are-the-best-essential-oils-for-arthritis/, last accessed February 2, 2017. “What is Arthritis?”, Arthritis Foundation web site; http://www.arthritis.org/about-arthritis/understanding-arthritis/what-is-arthritis.php, last accessed February 2, 2017. “Essential Oils”, Rheumatoid Arthritis web site; https://www.rheumatoidarthritis.org/living-with-ra/diet/essential-oils/, last accessed February 2, 2017.